So just like Dubba, I also received a free shipment of products from Wells. When I got the list of the products I would be receiving, the lady mentioned she would be including one of her favorite products in the shipment. I see no better way to start off this slew of reviews than by taking a look at that product. 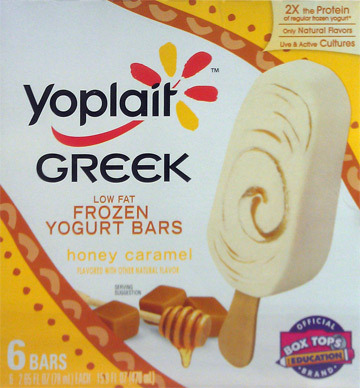 Without further ado, I give to you Yoplait Honey Caramel Frozen Yogurt Bars. I'd like to preface this review by saying I have a love/hate relationship with honey. I'm a fan of it when it plays a supporting role and isn't the main flavor. However, I am not Winnie the Pooh and I don't enjoy feeling like I'm sucking on one of those store bought honey bears either. We all know I love caramel though, so hopefully that will be the prevailing flavor. Is it just me or do all of these greek yogurt bars look alike? While not having as many prominent caramel swirls as the box, the bar pretty much looks as advertised. Taking a bite…okay that’s strange, it seems to have developed some sort of icy shell. Not sure if that intentional but it does give this bar an added bit of texture. The bar is only slightly creamy even after being out for a bit while I took photos. Not exactly a deal breaker but I’d like for it to have a bit more creaminess. All of that turns into an afterthought though because these bars taste delicious. You’re first hit by a slight tartness from the greek yogurt but right after a lot of sweetness comes through mainly from the caramel. The honey seems to stay in the background. The caramel isn’t super sweet but it’s just enough to counteract and balance the natural tartness of the greek yogurt. The honey flavor is very subtle, which is something I appreciate. It’s more or less just adds a little more sweetness without overpowering the caramel. The flavor of the bar as a whole isn’t all that intense but it’s a light treat that I could see pleasing most caramel fans. My main gripe with these bars is that they’re quite tiny. At 90 calories a bar though, you can easily justify eating more than one of them. I can’t say these are my favorite novelty but I can see why the lady from Wells feels that way. Eating a pint is very satisfying. My only experience with the pints come from the Raspberry Fig flavor I just reviewed. Is there a chalkiness to this flavors pint version as well? hard to say not knowing your area. Any Super Walmart should have them. try to search out a grocery store near work maybe. I sam addicted to these bars. I buy them now at Albertson's in Los Angeles. Walmart no longer carries the Yoplait frozen Greek yogurt Honey/Caramel bars. Kroger stores in our area dont carry them either. WHERE can we find them? Eat 3 bars a day. Lost without them! Live in Ft. Wayne, IN area. Best ever bars!!! The Raspberry flavor is equal to the Caramel but the Blueberry Granola is not good at all. I am in CA for the Winter and can't find them. They are the greatest and am too, lost without them.